A memorial mass for family and friends is scheduled for 10:30 a.m. Wednesday, Nov. 8, at San Jose Catholic Church in Carlsbad for Martina Hernandez Barrera. Barrera, 83, left his earth peacefully Wednesday, Oct. 11, 2017, in Dallas, Texas, due to complications of dementia. Fr. Martin Cordero will officiate the services. A private interment for family will be held at 1:30 p.m. at Woodbine Cemetery. A rosary will be recited at 10 a.m. Wednesday at San Jose Catholic Church. Martina was born Jan. 30, 1934, in Candelaria, Texas, the daughter of Martin and Apolonia (Solis) Hernandez. She moved to Artesia as a young child and resided here until 2013. In 1952, she married Ramon Subia Barrera. Martina always enjoyed spending time with her family, gardening, and cooking. She was a wonderful cook and passed down her love of cooking to her children. 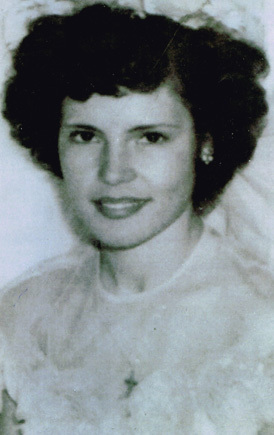 Survivors include daughters Lupe Barrera-Hightower of Allen, Texas, Lucia Franco of Carlsbad, Fidela Franco and husband David of Carlsbad, Lisa McShane and husband Bob of Dallas, Texas, and Deanna Miles and husband Rance of Dallas; son Ramon Barrera and wife Candice of Artesia; five grandchildren; two great-grandchildren; sisters Juana Balencia of Artesia and Socorro Medina of Lovington; and numerous nieces and nephews. She was preceded in death by her parents, her husband, two sisters, and four brothers. Although Martina suffered from dementia, the connection to her children remained constant. As a family, we embarked on this uphill journey with her, making the most of each and every day for the past nine years. She left loving her family as much as each of us love her, and she will forever live in our hearts and in our memories.